The best part about going to the cinema is the snacks; well, it would be the snacks if they weren’t so bloody expensive. Regardless, sitting back and watching a new movie just wouldn’t be the same without a big tub of popcorn and a Tango Ice Blast, and maybe a share bag of sweets to go with it. But if your New Year’s resolution is to cut back on the calories then you might want to pay attention to a recent survey, which has found that the average Brit tucks into almost 13,000 calories a year – just while watching films at the cinema. Researchers found film fans will eat sweets, popcorn and hotdogs containing 1,795 calories every time they watch something on the big screen – almost the same as a woman’s recommended daily amount. And with the average adult making seven trips to the cinema a year, that amounts to a total of 12,565 calories annually. 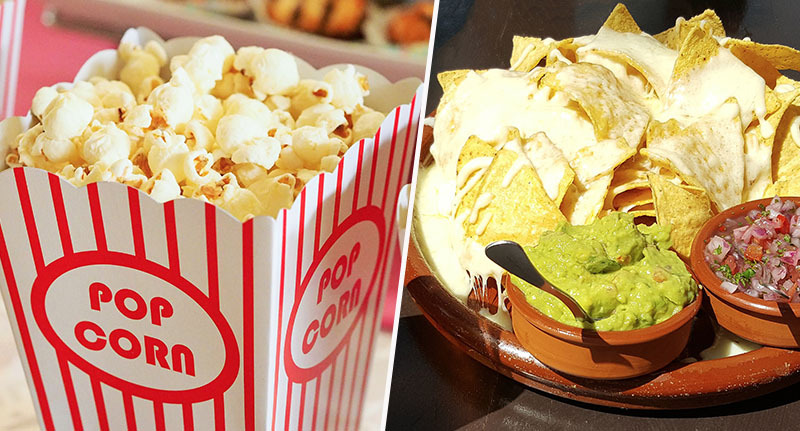 The research, conducted by Chilean Blueberries, found popcorn is the nation’s most popular movie food (no contest) – followed by sweets, Maltesers, ice cream and nachos. While the average film fan consumes 1,988 calories on popcorn at the cinema in a year, hot dogs account for 1,974 calories, and nachos a massive 3,773. Must be all the cheese, I guess. Our results found that Brits’ love of going to the cinema seems to be stronger than ever, however, one area many cinemas struggle with is their selection of healthy snacks. Many cinema-goers would prefer to have healthier options than the traditional hot dogs, nachos or popcorn that are usually offered. The study of 2,000 adults found four in 10 would like cinemas to serve healthier snacks, with one in four wishing they could enjoy mixed nuts and 15 per cent believing fresh berries to be the perfect accompaniment. A tenth would like to crunch on carrot sticks, while 15 per cent would like some healthy banana chips to snack on. Almost 90 per cent think current cinema snacks are overpriced, with a fifth saying they’d be happy to pay a bit more for their movie ticket if the food was cheaper. The high prices have gotten so bad that they’ve led to nine in 10 people sneaking their own snacks into the theatre, rather than pay inflated prices. I mean, we’ve all been there. And forty-five per cent of those surveyed said they believe cinemas and other leisure outlets have a duty to offer healthier snacks like fruit, with one in four believing they are contributing to the obesity problem among children. A fifth of Brits polled, via Onepoll.com, even say they’d rather snack on blueberries while watching a film than sweet popcorn or chocolate. It’s not always easy to make healthier snacking choices either at home or at the cinema, but blueberries can be a great alternative to sweets or chocolate. They are full to the brim with antioxidants, nutrients and vitamins. They also increase the brain’s production of feel-good dopamine, a natural neurotransmitter that makes you feel happy.